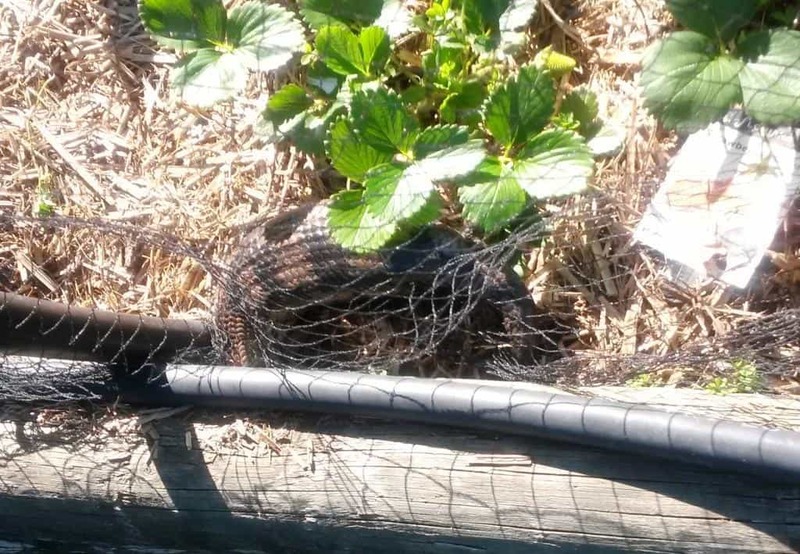 You would think this blue tongue lizard would have a red tongue the number of strawberries he has eaten. He is trying to hurriedly make off, but in his haste he has tangled himself temporarily in the netting. He knows the way around it though. I just weeded that bed this morning. There were a few beauties I was drooling to devour myself tomorrow, but this little fella seems able to consume his own weight in srawbs daily. What to do? As you can see, the bed is netted against birds, but this bloke has an awesome network of tunnels extending more than twenty feet from the strawberry bed to the compost bins to a further system of tunnels underneath the greenhouse and old dairy nearby…Spot barks at him but he has been forbidden to bite him as anti-snake training; besides he might bite back. He can put on a fairly impressive open-mouth display. I am beginning to regret my many acts of kindness towards blue tongues over the years: rescuing them from roadways, removing ticks from their ears, etc. I could plant more strawberries but this little guy is no doubt working on planting more blue tongue lizards!